Create your own weekly planner using our Free Printable Weekly Planner template for Excel. Our weekly planner was designed to allow you to print weekly planner pages for letter-size 3-ring binders. 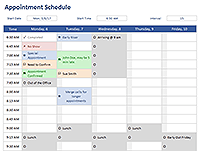 If you're schedule is extremely packed, you can try our daily planner. If you need something really fast, go ahead and print one of our free weekly planner pages that are downloadable in PDF format. We also have a free weekly meal planner and a monthly planner template that you might want to take a look at. NOTE (8/26/15): I've created a new weekly personal planner that in my opinion is much more useful than the one on this page. Try the new Personal Planner Template! These two printable weekly planners are free PDF files that you can download and print very quickly. They may be useful if you don't care about showing dates or don't mind writing the dates in manually. 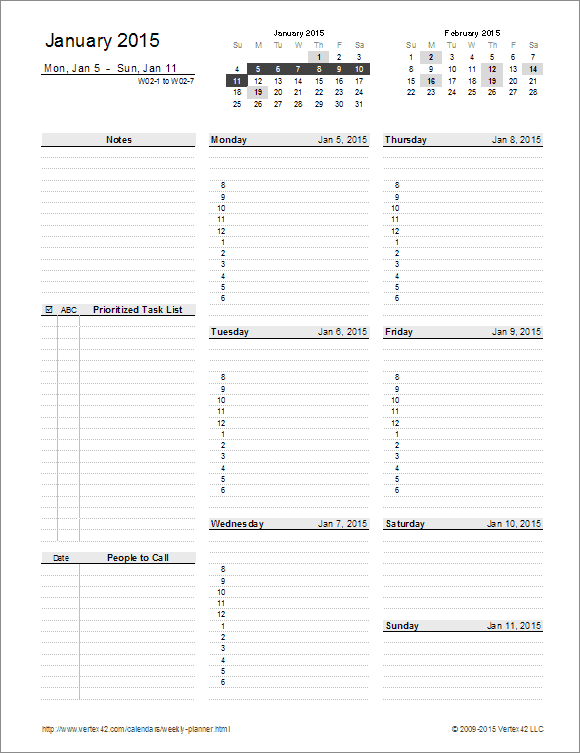 This Weekly Planner spreadsheet lets you print a weekly planner page for any week or year. You can enter birthdays, anniversaries, and other annual events. When you change the week, up to 3 holidays or events will be shown under each day of the week (see the screenshot as an example). 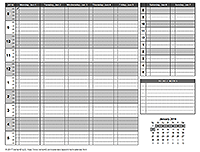 If you have to pay for your own paper and ink, it may not be cost effective for you to print your own weekly planner. That is something you'll need to figure out and it depends on how fancy of a planner you were thinking of buying (leather binding vs. spiral bound softcover for example). If you are a student and use 3-ring binders to hold your homework and stuff, you can print a semester's worth of weekly planner pages and include them in your binder. That's only about 8 pieces of paper if you print on the front and back. One of the fancy things about this weekly planner template is that you can record the month and day of all your family and friends' birthdays and when you change the date to print a new week, up to 3 holidays or events per day are automatically listed in the planner. We've also included formulas for many common holidays. The ISO Week Number is shown under the date as W01-7 where 01 is the week number and 7 is the day of the week. Holidays and Dates that you define in the Events worksheet are highlighted in the mini calendars. The current week is also highlighted. The format for these calendars can be changed in the MiniCalendars worksheet (the highlighting is controlled using Conditional Formatting). Has a Prioritized Task List area where you can include your weekly To Do list. Includes a Notes and People to Call section. This schedule isn't what I'd call a "weekly planner", but this type of format is very common for weekly planning and scheduling. Printable Weekly Calendars - CalendarsQuick.com - Some very nice formats.